I am excited to finally reveal a brand new wind chime! 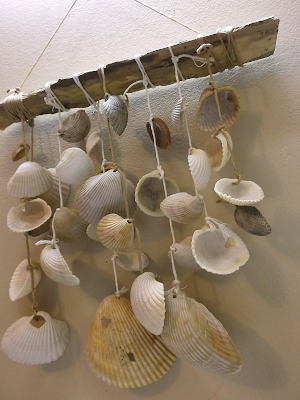 I created this one out of sea shells and drift wood that I found at a recent trip to Charleston's own Folly Beach this summer. 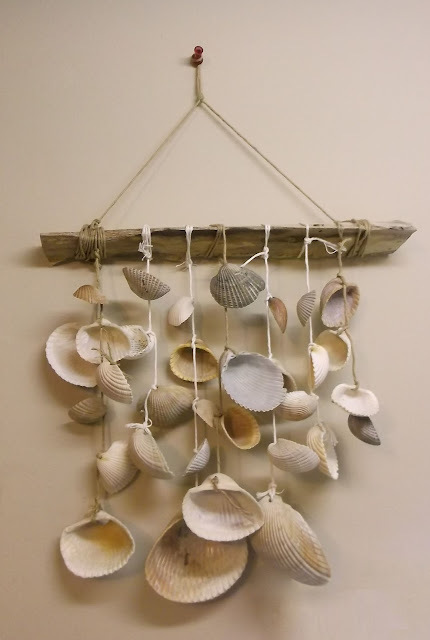 I call it my "Bone Chime" because the sound of the shells kind of sounds like bones clanging up against each other... not like I would know what that sounds like or anything. I was fascinated by the variety of sea shells available at Folly Beach this summer. There were so many of them to choose from, in all sorts of different shapes and sizes. At the time, I wasn't quite sure what project I was going to do with them, but I was particularly attracted to the shells with holes in them. It was like these shells were created especially for artists- all ready for neatly stringing through wire for jewelry making. Or perhaps, like in my case, even making a wind chime. I wanted to find out how these "magical" holes turned up in those shells in the first place. I figured they were formed by being worn down by the ocean or as a natural process for their species. Boy, how naive I was. of the perfect and uniform bores of the moon snails. After doing a little research, I find it kind of ironic that something beautiful can be made out of something so brutal. "Such holes are caused by predatory snails, usually in the family Naticidae (commonly called "moon snails")... They use their radula, a sort of tongue covered with tiny toothlike projections, to rasp a hole in the [shell,] allowing them to insert their proboscis and feed on the soft parts..."
"A shell two millimeters thick (approximately the distance across the top of the letter w) can take eight hours to penetrate..."
According to these facts, not only were the shells eaten alive, but they were practically tortured by the moon snails in the long, drawn out process of being devoured. Knowing this morbid fact about the shells made me feel somewhat remorseful for using them in such a whimsical way. But at the same time, I felt it had given these poor creatures some sort of extra purpose besides being a small snack for a snail. In a way, this truly is a bone wind chime because it is made from the "bones" of the unfortunate mollusks that didn't get to continue living their little clammy lives. Unconventional drift wood was used for the base of this wind chime. On a more positive note, I also found this beautiful piece of "drift wood" at Folly as well. I guess technically it's drift wood- the beach didn't have much to offer when it came to traditional pieces of wood. This is actually a shard of palmetto leaf, which are plentiful around the Lowcountry. When I found it, I thought it was a piece of a wooden dock that had some how washed up on the beach. The surface of the branch's pale white color looks like it has been hand painted. I find it kind of beautiful how nature finds ways to mimic the artistic process, even if it's sort of harsh about it some times. The shell bone wind chime posing outdoors with an unfortunate duo... a pair of snails. Thanks tiff! You should make your own! :) I will also be putting this piece up for sale after it shows in the "Watch Your Step" gallery.